Responding to the body within the context of a ceramic vessel is an exciting investigation that provides unlimited possibilities for interpretation. Referencing the human figure creates opportunities for infinite abstraction. These references include human characteristics, which make each person unique. 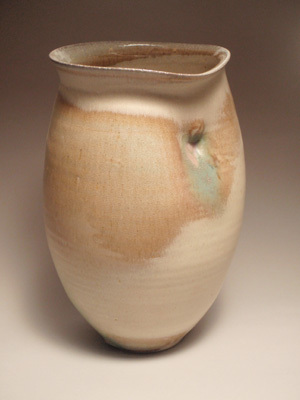 No two human forms are exactly the same, so each ceramic object should have its own unique idiosyncrasies such as texture, wrinkles, cracks, protrusions, intrusions, blemishes, and other “imperfections”. In the same way that imperfections make individuals more interesting, it is these imperfections that make the ceramic forms more engaging. The combination of these abstracted elements creates a dynamic form, providing the viewer with an opportunity to explore the piece intuitively. I leave it up to the viewer to determine what makes these forms human-like. It is this perception that others have of my work that I find stimulating. These pieces were created with an ambiguous intent, leaving it open for interpretations. Touch is element that is common between humans and pottery. My hands are used as tools to create objects that serve utilitarian purpose. The viewer has the opportunity to experience the finished piece without considering the creative process behind it. The process is a hidden creativity that the viewer does not experience. This body of work provides an opportunity for the viewer to experience the maker’s hand and the relationship that is created between the maker and object. Presenting trimmings alongside of finished works provides a valuable visual into a portion of the creative process. The ceramic process is what triggered my fascination with the medium. Clay lends itself to whatever the maker can imagine, providing unlimited possibilities for artistic creation. This entry was posted in akron, Art News, arts, galleries, ohio, senior show, shows and tagged akron, art, art news, exhibit, exhibition, gallery, ohio, senior, show, we. Bookmark the permalink.